What color rug would work for my home? 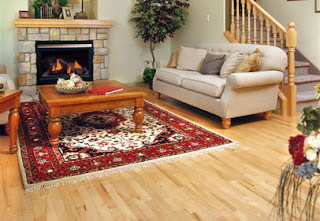 A rug with a bold, overall design can be the focal point of a room with a chair and sofa in solid or subdued patterns. Light colored rugs make a room look more spacious. Deeper colors lend coziness to a room. You might want to bring a picture of the place where you want to put the area rug to help determine colors and patterns. Check out these room scenes to get a feel for the impact an area rug can make. Quick Tip: Remember to bring a sofa cushion, a pillow, a piece of art, a paint chip or take a swatch of any fabrics you’d like to match with you when you shop for a rug. That way, you’ll have a better idea of what will complement your existing décor. What shape would work best in your space? Don’t be boxed in by the idea of getting a rectangular rug. Kermans offers round, square and custom shaped rugs as well. What size rug do you need? Before you go shopping, measure the size of the room and the area you want to cover. To make the room appear larger, show a border of the flooring around the perimeter of the room. The type of room and furniture placement must also be taken into consideration. There are no official rules for furniture being placed on or off the rug. Sizing up a room to make sure the rug is proportional should be a design decision. Kermans design consultants will be happy to talk through the pros and cons of different options with you. How busy is the activity in the room where you're placing the rug? You might need a pattern that hides wear. Fringe may not be the best choice for you. This is also a good time to consider a rug pad. Kermans' pads absorb the impact of feet and noise, reduce wear and tear on the rug and make vacuuming easier. What type of rug do you need? Don’t discount machine-made rugs. They look strikingly similar to a handmade rug, but they’re usually much less expensive. Kermans carries a wide variety of area rugs - our top selling rugs are from Karastan, and Karastan’s Rugs have a 15-20 year manufacturers warranty! It's the perfect time to buy a new area rug - it's National Karastan Month! When you buy a Karastan area rug (or carpet) you can receive rebates up to $1,000. Sale going from now until the end of May. Don't let this great sale pass you by. Stop by Kermans Flooring in the Castleton area of Indianapolis and ask to talk to one of our qualified design consultants about our selection of area rugs. Become a fan on Facebook for regular flooring and design tips.